I have more exciting news today. I am going to be Guest Designing on the blog at Pink and Main during the month of July. 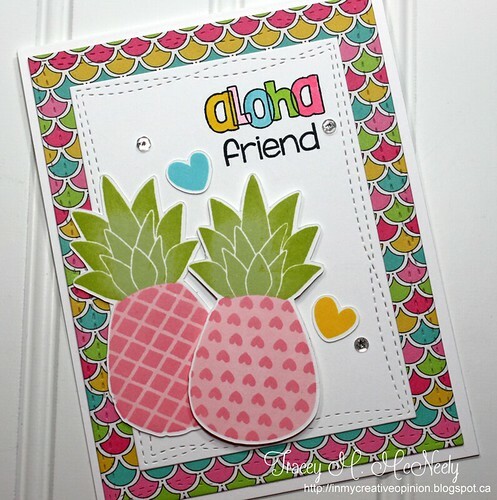 Owner Michelle Currie sent me the Aloha Pineapple stamp set and the Beach Babe 6 x 6 Paper Pad Collection to play with. The layered pineapple is so much fun and the stamps were so easy to line up. Here is the card I created for today. 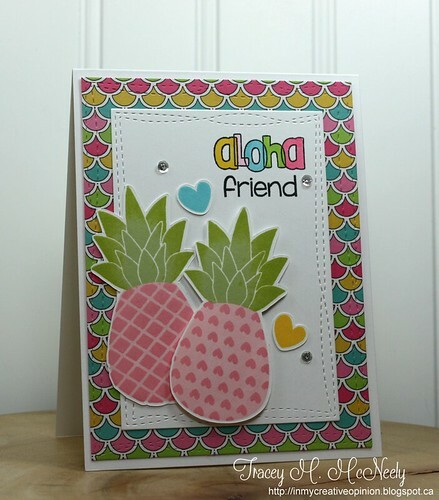 To make my card I started by stamping and die cutting two pink pineapples from the Aloha Pineapple stamp set and a few hearts from the same set. I cut a panel from the Beach Babe Paper Pad and set it aside. I cut a smaller panel of white cardstock and I stamped the 'Aloha friend' from the set and coloured the outline sentiment with Copic markers that matched the paper. I used RV10, RV13, BG53, Y15 and YG03. Once I had all my pieces together and the sentiment completed I adhered the Patterned Paper panel to a white card base followed by the smaller white panel. Then I adhered the pineapples slightly off centre, the one on top was adhered with foam tape. I added a couple hearts and a few Stickles filled sequins to complete the card. 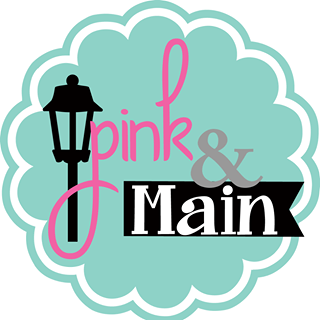 Head over to Pink and Main for more blog inspiration. As you know from Instagram I so love everything about this darling card! Congratulations! Yippee, congrats on guesting Tracey!! What a cute card. The paper is fun and the pineapples are adorable! Congratulations on the GD! Sweet card. Congrats on your guest spot! Your card is so wonderful for summer. Love the pineapples and that fabulous paper! Congrats on your Guest Designer spot, Tracey! Your pineapples are so pretty and I love how you paired them with the patterned papers...Such a lovely crisp, clean design! Congratulations on the guest designing!! I adore those PINK pineapples that you created. Oh so FUN! !